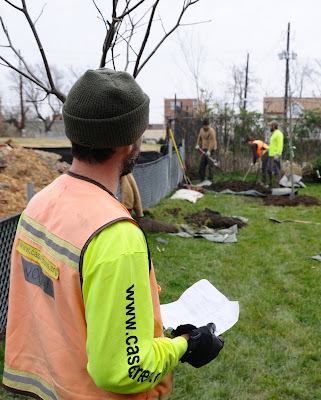 Casey Trees was invited to work with Mi Casa and provide quality tree canopies through our RiverSmart Homes program. Mi Casa contacted us through their deputy director, Elin Zurbrigg and Heather Whitlow (former Casey Trees Director of Planning and Design). Seven of Mi Casa's newest low-income houses were selected to receive trees for their future owners. Mi Casa has taken seven abandoned lots in the Ivy City area and built houses intended for low-income families. The houses feature sustainable ideas, like rain barrels, that allow rainwater to be collected and reused instead of flowing down storm drains. The houses also feature fences to help give these homes a bit of privacy from the streets and neighbors. In addition to these features, Mi Casa asked Casey Trees to plant some trees for these new homes so that future owners could enjoy the benefits of having canopy coverage. "The goal was to get a shade tree, flowering tree and evergreen tree on each of the seven sites, or at least two out of three of each tree type as space allowed," said Jim Woodworth, Director of Tree Planting. Shade trees were planted to help keep the new homes cool and provide shade for the yards. Flowering trees were given prominent placement near the houses so that families could enjoy their seasonal beauty. Additional privacy was brought to the houses through the use of evergreen trees, whose foliage would protect the yards from public view as the trees mature. As luck would have it, Mi Casa let us know that two of the houses were sold on the day of the planting. Hopefully these homeowners and their neighbors will be able to enjoy these new trees for generations to come. I'm glad you are supporting this advocacy! Planting trees in the neighborhood does not only save the environment but it can also change the vibe in the community. I hope I could find new homes for sale in your city. I would want to participate in this movement.